▲ 40 international and local students listening to explonation about the language exchange program in the orientation session held by the Office of Administrative Affairs on April 2. 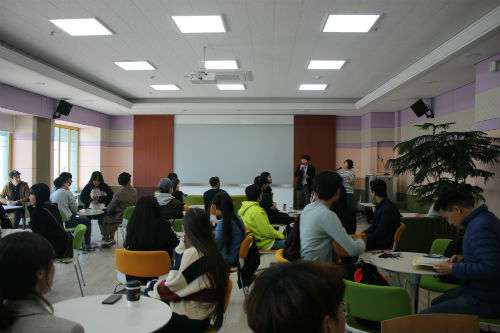 The language exchange program between international and local students on Yeosu campus started on March 25. The Office of Administrative Affairs held the orientation session for 40 students selected to participate in the program on April 2. It aims to promote cultural exchanges between students from Korea and overseas and develop their language skills through exchanging language and sharing their cultural experiences for reciprocal learning. Participants matched one-to-one with their partner have to meet and exchange language and also get the opportunity to join diverse activities and events at their own leisure for more than two hours per week till June 6. 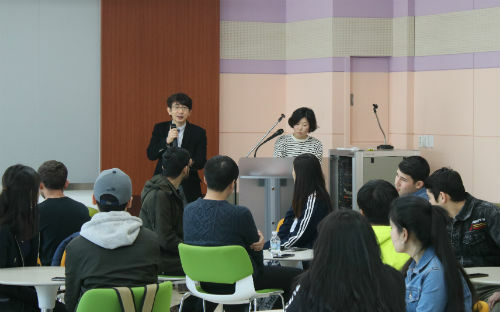 ▲ 40 international and local students selected to participate in the language exchange program operated by the Office of Administrative Affairs listening to explonation about the program in the orientation session held on April 2.